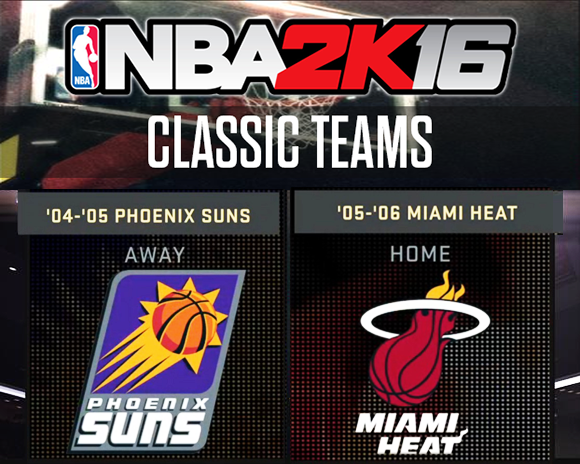 As promised, 2K Sports has revealed two new classic teams for NBA 2K16. Today's reveal includes the 2004-2005 Phoenix Suns and the 2005-2006 Miami Heat. Led by Shaquille O’Neal and Dwayne Wade, the '05-'06 Miami Heat were able to win their first NBA championship beating the Dallas Mavericks 4-2. The team was nicknamed "15 Strong". The '04-'05 Phoenix Suns is arguably the most exciting offense in NBA history. It was the start of Steve Nash’s MVP campaign, start of Amare Stoudemire’s dominance on the offensive end, and the beginning of "Seven Seconds Of Less" basketball offense. If you like a high-scoring and fast-paced ball game, make sure to take advantage of this squad in NBA 2K16. There will be 12 new classic teams to be added in this year. So far, 10 of them have now been confirmed, so there are 2 more left to be announced next week. For more updates, screenshots and videos, check out our NBA 2K16 page.